The aim of this guide is to describe how to go about analysing and interpreting the data collected from habitat impact assessment. 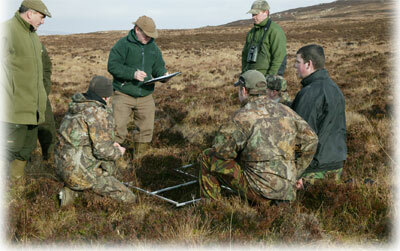 Interpretation will depend on objectives but a clear trend will indicate which way the habitat is ‘going’. The guides “Habitat Impact Assessment: Principles and Habitat Impact Assessment: Principles in Practice” should be regarded as essential introductions to this subject. 2. What changes mean in relation to the objectives for the habitat*. Compare changes against the objectives for the habitat (see example table below). Consider other relevant data (for example, deer count information, sheep numbers). Take into account timescale and likely impact of changes recorded (for example, in woodland: are sufficient seedlings escaping browsing to replace existing trees?). Normally habitat change is quite slow. A series of measures over 3 – 5 years will probably be needed. Note that it is not just trends that need to be taken account of but the level of impact. For example if Moderate of High impacts (greater than 33% shoots browsed**) are recorded on heather year after year (but no change in trend) then they are likely to lead to a loss of heather. Public interests and deer management objective for Dwarf Shrub Heath Specific definition of ‘damage’ Who determines ‘damage’? Natura interests***** Extent, structure and function of impacted habitat threatened. Look at incentives available i.e. grants to improve habitat.